Jackie Roy was one of the athletes honoured at the 2009 BC Premier's Athletic Awards luncheon 2009 at the Sheraton Wall Centre February 12th. The awards are go to athletes who demonstrate the potential and commitment to represent British Columbia and Canada in athletic competition to relieve some of the pressures associated with training and competition. 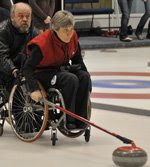 Jackie will be playing lead Jim Armstrong's team that will defend its national title in Nova Scotia in March. Darryl Neighbour won this award in 2008. Great Programs.................I don't believe Armstrong has garnered a dollar since his involvement..........why does he even continue, the way he is dealt with??????? I understand, Eric, as you indicated earlier on another blog, is that he is a good guy...or at least okay...and he has the best interest of the program at heart.....man, do we look after the people that get the media attention.....we deserve to be lost on page 13 of the newspaper.